Training plan? What training plan? Monday 1/28/13 - Plan: RUN easy 3 miles at 11:18 pace. Did: RUN 3 miles on the track at the gym in 31 min (10:21 pace). Trying out some Newtons and ran the first mile in them, then switched to my Asics GT 2170s for the other two. I totally blew my pace today. Oops. Sometimes the legs just want to move I guess. FInished with a 45 min CROSSTRAIN yoga class that was more strength than stretchy. Tuesday 1/29/13 - Plan: BIKE. Did: BIKE 14 miles in 1 hour using the big gear (13.8 mph). Wednesday 1/30/13 - Plan: RUN easy 3 miles at 11:18 pace/STRENGTH. Did: RUN 3 miles on the track again, with 1.5 miles in Newtons. 33:48 (11:15 pace) This run felt TERRIBLE but the brightside? at least I nailed my training pace. Finished with 15 min STRENGTH abs. Thursday 1/31/13 - Plan: BIKE/STRENGTH. Did: BIKE easy 5.4 miles in 30 min (a slow 10.8 mph). STRENGTH 15 min of abs. 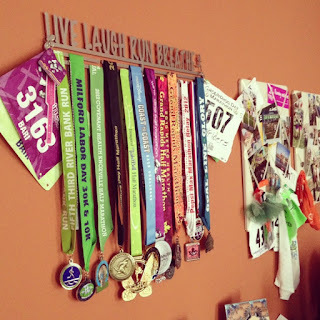 Saturday 2/2/13 - Plan: RUN "long" run of 4 miles at 11:18 pace. Did: "RUN" 13.1 miles - I ran the Groundhog Day Half Marathon :) Or rather, I ran the first 4.4 mile loop and then mostly walked the other 2 loops. I hadn't run more than 7 miles since my half back in November, so I knew I wasn't in any kind of shape to run the whole thing. Plus, this was my first "trail" half and I knew the conditions were NOT PR material. It was an absolute blast with my friends, we dressed in crazy Groundhog Day costumes, and enjoyed the 15* temps and 12+ inches of fresh powder. You can read my race report and see lots of pictures here! Sunday 2/3/13 - Plan: I didn't have one. Did: another rest day. I threw in a little foam rolling and stretching, but mostly I iced my foot that I torqued a bit running for so long in the snow. In hindsight, I should've tried to do something to move because I was VERY sore on Monday. Anyhoo. Going to take it easy on the running this next week and pray I didn't do any real damage. I guess looking back at the week, I didn't throw the plan TOTALLY out the window. I just more than tripled my long run, blew my training paces, and managed to tweak my foot/ankle. The foot and ankle are feeling better today so I'm going to try a short run after school. One of those great workout days where you bring 3 pair of shoes to the gym - cycle, Newtons and regular running shoes :) Have you ever gone completely off book during a training cycle? How did it work out for you? While you are here, I have a small favor to ask. 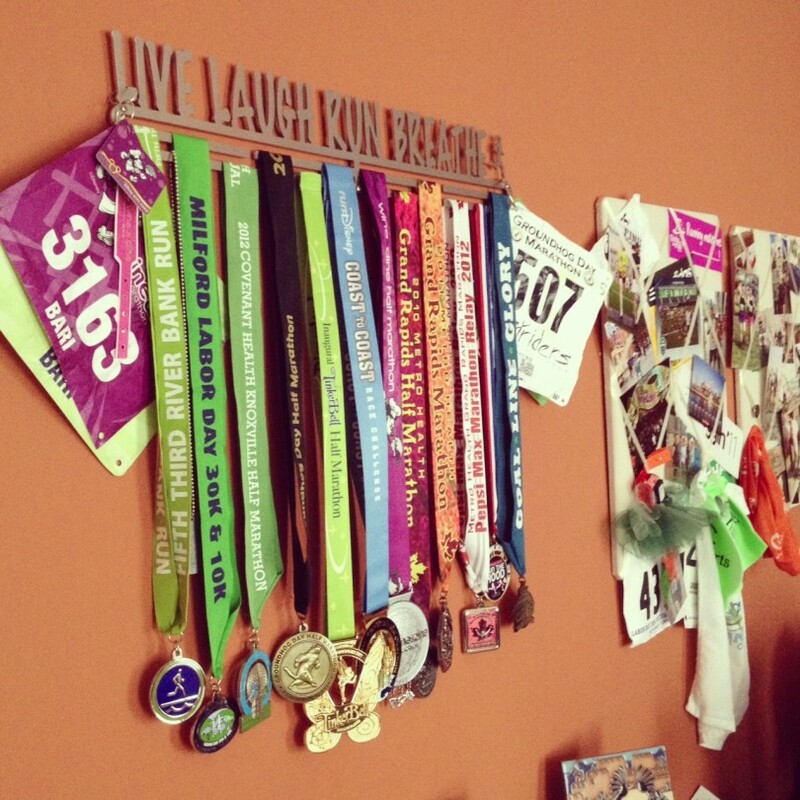 I've entered a photo to win a new medal display from Allied Medal Displays. Could you please head over here and vote for my picture? You can vote once a day! Thanks so much! Fitness Friday: get what you can get! Groundhog Day Half Marathon: race report!